We are entering our 7th year as a distributor for Unilock concrete pavers, retaining wall systems, natural stone and porcelain tile as part of our lineup of hardscaping products. We are proud to say that our Unilock business continues to grow, and more customers each year are discovering the distinctive patterns and colors available within the Unilock product line. We had an excellent year in 2017, and were honored at Unilock’s Awards of Excellence for Excellent Select Sales. This award is thanks in large part to our work at The Shoppes at Belmont, where we furnished Unilock’s Rivercrest Wall and Brussels Block pavers. As we start the new season, we are looking forward to another exciting year, and there are some important updates regarding new selections and other Unilock product changes. Unilock is also expanding and updating their Beacon Hill collection of patio pavers for 2018. 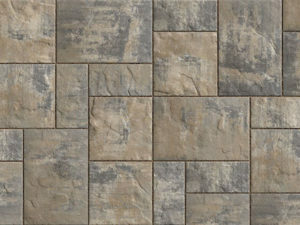 Beacon Hill XL is a new size option available in both Beacon Hill Flagstone and Beacon Hill Smooth. This 21” x 25” rectangle can be integrated into the typical random Beacon Hill pattern, and is sold separately from the Random Bundle. Fossil (shown at right) is a new color in the Beacon Hill collection, and is scheduled to be available in May 2018. Copper Ridge is another color addition to Beacon Hill, and will replace Desert Valley which is being discontinued. Umbriano is now available in French Grey and Harvest Brown. All Umbriano colors are also now available in the random bundle. Also for 2018, Penn Stone is also taking a brief pause with Unilock’s Bristol Valley pattern. 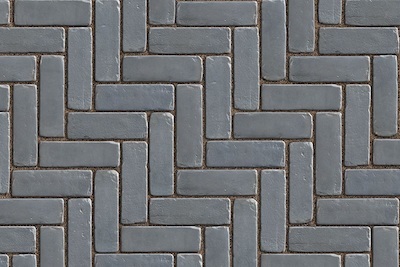 Currently, this pattern is only produced in Unilock’s Chicago manufacturing plant. Later this summer, production of this pattern will resume in New York, but until that time we recommend that customers select a different pattern. Once production resumes, Bristol Valley will be available in Steel Mountain and Bavarian colors, and will feature EasyClean Technology. These exciting product, pattern and color additions will continue to position Unilock as a leader in the concrete hardscaping industry, and we’re proud to represent their line of patio pavers and retaining wall systems at Penn Stone.